The Racing Steps Foundation-backed driver, who helped the #17 Team WRT Audi R8 LMS to start from pole position earlier in the day, would allow team-mate Stuart Leonard to start the finale but having made an assured getaway from the rolling start, the Briton made a mistake by outbraking himself and sliding wide at Turn 10 allowing the fellow #5 WRT Audi of Marcel Fässler and #84 HTP Mercedes-AMG GT3 through. The duo quickly pulled away from Leonard by over four seconds while Leonard soon fell into the clutches of the #88 Akka ASP machine of Daniel Juncadella, demoting him to fourth place. With under an hour of the race complete, Leonard took to the pit lane to make the first driver change as he switched for Dennis to take to the wheel. Following a rapid stop from the Team WRT mechanics, Dennis was vaulted back into contention for the race, returning to the track in third position as cars around also completed their opening driver change. Dennis exited the pit lane on the tail of the #5 Audi in the hands of Will Stevens and the leading #88 Mercedes now in the hands of Felix Serralles. As Stevens fell into retirement, Dennis maintained a gap of three seconds to Serralles with nearest challenger, the #63 Grasser Racing Lamborghini Huracan GT3 of Andrea Caldarelli falling progressively further back by over 10 seconds. With just over an hour remaining, Dennis completed his stint by handing the car over to team-mate Robin Frijns, with the #88 machine also pitting for Tristan Vautier to vie for the race victory. Frijns remained a single second behind Vautier throughout the remainder of the final hour to preserve tyre wear, launching his attack on the final lap with light rain falling. Closing up on to the Mercedes’ gearbox, the tricky greasy conditions made an attempt even more challenging. Frijns opted for the outside line around the final chicane, but only managed to slide over it, forcing him to cede any potential advantage to Vautier and cross the line seven tenths of a second behind. Fellow RSF-backed Ben Barnicoat was hoping for a better result than in the early qualifying session in which he and Strakka Racing team-mates Sam Tordoff and Jonny Kane started from 33rd position on the grid. Tordoff began the race in the team’s McLaren 650 S GT3 machine, making a solid getaway to progress up to 27th position after which he handed the car over to Barnicoat with an hour of the race completed. 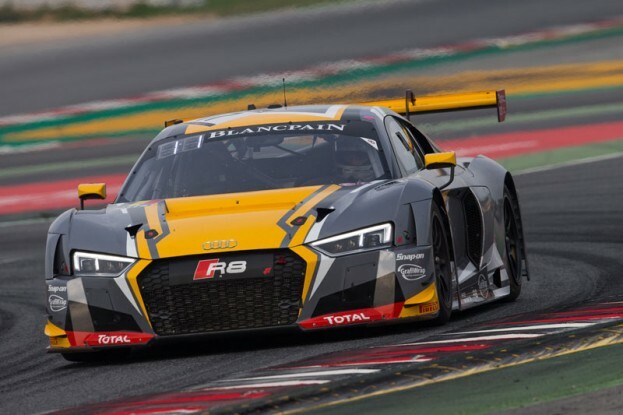 Barnicoat went on to produce the best stint of his maiden Blancpain season, vaulting through the field to scythe through the field and making his way up to ninth position while also setting the fastest lap of the race. After handing the car over to Kane for the final hour, a poor pit stop put Kane out in 11th position but having overshot a corner early in his stint, he ceded six positions dropping him to 17th position. Kane managed to claw back three places in the final 45 minutes to cross the line in 14th position. “The race was great in the most part,” Barnicoat said. “We improved the car from qualifying and made a really good step in performance which allowed me to have my best stint of the season. Following the #88 Mercedes and #17 Audi on the podium was the #63 Lamborghini of Caldarelli, Christian Engelhart and Mirko Bortolotti, the result handing the overall Blancpain GT series title to Engelhart and Bortolotti. Dennis’ result ensured he finished his first season in GT racing in 13th position in the overall standings, with Barnicoat’s struggles evident in 53rd place.